While the scene with anti-ban protesters and civil rights lawyers was repeated at all major international airports across the United States, what was special about San Francisco was the presence of Silicon Valley tech elite, including Google cofounder Sergey Brin and Y Combinator president Sam Altman, among the protesters. The Who's Who of America's technology world work with tens of thousands of Muslim technologists everyday. They have all spoken out against Trump's Muslim ban. Meanwhile, several Silicon Valley venture capitalists have committed to match donations to American Civil Liberties Union (ACLU), the biggest organization of civil rights lawyers in the United States. ACLU says it has already raised over $10 million so far to fight Trump's Muslim Ban in the US Court system. The US-born Muslims make up the largest percentage at 34% of all Muslims in San Francisco Bay Area, followed by 14% born in Pakistan, 11% in Afghanistan, 10% in India, 3% in Egypt and 2% each in Iran, Jordan, Palestine and Yemen. While Sergey Brin (Google) and Sam Altman (Y Combinator) physically joined the protest at San Francisco International Airport, there are many more among the Who's Who of the tech world who have voiced their opposition to Trump's Muslim Ban: Facebook founder Mark Zuckerberg, Tesla founder Elon Musk, Netflix founder Reed Hastings, Apple CEO Tim Cook, PayPal cofounder Max Levchin, AirBnB founder Brian Chesky, DropBox founder Drew Houston, and many many more. They all know how critical the Muslim immigrant talent is to the success of their companies. Many of the tech elite cite the fact that legendary Apple founder Steve Jobs was the son a Syrian Muslim immigrant father Abdul Fattah Jandali. Silicon Valley tech elite have joined the growing protests against Trump's Muslim Ban. 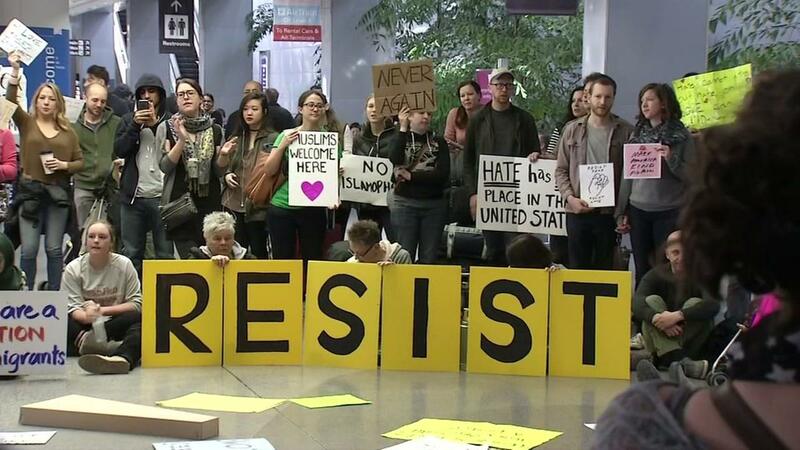 Some have shown up at San Francisco International Airport while others have issued statements through social media to voice their opposition. Several venture capitalists have committed to match all individual contributions to ACLU, the civil rights lawyers' organization that has already raised $10 million over the weekend to fight Trump's executive order banning Muslims. They all know how critical Muslim immigrant talent pool is for the continuing success of Silicon Valley technology industry. The American Civil Liberties Union broke all its fundraising records this weekend as it became the main group challenging President Donald Trump’s immigration restrictions. The ACLU raised $24,164,691 this weekend from 356,306 online donations after Trump signed the order suspending the country’s refugee program and banning entry into the United States of citizens from seven predominantly Muslim countries. The nonprofit organization usually raises $4 million a year from online donations, ACLU executive director Anthony Romero said. The ACLU filed the lawsuit on behalf of two Iraqi men who were detained at the JFK Airport in New York that resulted in a federal judge blocking part of Trump’s order on Saturday night. The organization that vowed the day after the election to be “eternally vigilant” during Trump’s presidency has seen its membership double to 1 million members since Nov. 8. "People understand the threats the Trump administration poses and they are willing to take action to fight those threats," Romero said. "They don't just want to write a check and be done with it." The donations saw a huge boost thanks in part to some big headline-grabbing names supporting the ACLU’s efforts. Singer Sia, for example, wrote on Twitter that she would match up to $100,000 in donations. Rosie O’Donnell followed suit with the same pledge. The founders of ride-share company Lyft also said they would donate $1 million to the ACLU over the next four years. "Let me save the government some money and offer up the data right now," he (Fareed Zakaria, CNN GPS) said, quoting a study by Alex Nowrasteh of the CATO Institute, a conservative think tank that has tallied the number of Americans killed on US soil from 1975 to 2015 by citizens of the seven countries. "Indeed, Google, Facebook, Amazon and Microsoft all donated more to the Republican party than the Democratic party in the 2016 election, despite the Republican party’s anti-immigrant positions, according to the Center for Responsive Politics." Anon: " Oh so now Fareed Zakaria talks sense. I thought he only talks nonsense when he bashes Pakistan :-)"
But now Trump is planning to cut H1b visas that's spooking Indians. President-elect Donald Trump’s chief strategist seems to think there are too many immigrants leading Silicon Valley. Steve Bannon, who previously served as Breitbart News Network’s executive chairman, hinted at some of his views on foreign workers at technology companies in the past. In an interview between Trump and Bannon that took place last year, and that The Washington Post resurfaced yesterday, Bannon alluded to the idea that foreign students should return to their respective countries after attending school in the US, instead of sticking around and working at or starting tech companies. Meanwhile, foreign-born CEOs, including Microsoft’s Satya Nadella, have tried to quell concerns from employees. In a note last week, Nadella and Microsoft congratulated Trump, while saying that the company’s commitment to “fostering a diverse and inclusive culture” remains “steadfast.” Mark Zuckerberg-backed FWD.us has also said it plans to reject and work against a rollback or freeze on reform of the H-1B visa program. The H-1B visa is the most widely used system for bringing high-skilled foreign labor into the US. For now, Trump’s policy on those visas is still up in the air. The little boy was seen on CNN being showered by kisses from his mum as they were reunited. According to the Mirror, Senator Chris Van Hollen, who revealed that the child was from America, described the incident as ‘outrageous’. He allegedly added that the boy was detained despite authorities having advance notice of his arrival. Van Hollen added that he later tried to see if the child had been released – but was refused information by airport authorities. On Friday, Trump signed an executive order banning refugees from entering the country, during a Pentagon swearing-in ceremony for Secretary of Defence, James Mattis. President Donald Trump is currently considering an executive order that would make sweeping changes to highly-skilled foreign worker visa programs, including H-1B visas. A leaked draft of the executive order titled “Protecting American jobs and workers by strengthening the integrity of foreign worker visa programs” appeared on the New York Times Web site Jan. 27. “With this executive order, President Trump will help fulfill several campaign promises by aligning immigration policies with the national interest, and ensuring that officials administer our laws in a manner that prioritizes the interests of American workers and – to the maximum degree possible – the jobs, wages, and well-being of those workers,” read the draft order, signed by Andrew Bremberg, assistant to the president and the director of the Domestic Policy Council at the White House. Shares of top Indian IT companies sank Jan. 31 in response to news of the re-formatting of the H-1B program. A total of 65,000 H-1B visas are allocated each year, with about 70 percent going to Indians. The H-1B visa allows American employers to hire highly-skilled foreign workers for a two-year period, which can be renewed. Indian American immigration attorney Kalpana Peddibhotla, who handles a large number of H-1B applications each year, told India-West she has already seen a drop in applicants. Trump’s “Buy American, Hire Americans” campaign slogan has had a chilling effect on Indian nationals willing to travel to the U.S. for temporary work. “It is not a drop in need, it is a drop in the number of people willing to fill those needs,” said the Newark, Calif.-based attorney. The attorney said this was troubling, as it invites government oversight into private employers’ hiring decisions. “It imposes a lot of ambiguous language on employers,” she said. Furthermore, she told India-West, the term “national interest” is vague, and not defined in the order, noting that the order mandates DHS within 90 days to determine whether foreign worker programs violate prevailing immigration laws and are not in the national interest. The text of the order does not impose an immediate freeze on the number of H-1B visas issued this year, but Peddibhotla said the language suggests there will be a reduction in the number of visas issued in future years. Footage of a teenage victim of a hit-and-run accident pleading with unresponsive onlookers to take him to hospital has caused shock in India. Local media reported people gathered around and took pictures and videos of the injured teen, but did not help him. Anwar Ali, 17, was taken to hospital around half an hour after his bicycle collided with a bus in Karnataka state. He bled to death. Doctors say he could have survived if he had received medical care sooner. The incident in Koppal district in Karnataka has revived controversy about people being reluctant to help road accident victims in India. Some activists argue that it is not a lack of compassion but an entire system stacked against helping road victims. "The foremost reason is intimidation by police," safety campaigner Piyush Tewari told the BBC last year. "Oftentimes if you assist someone the police will assume you're helping that person out of guilt." Apart from the fear of being falsely implicated, people also worry about becoming trapped as a witness in a court case - legal proceedings can be notoriously protracted in India. And if they helped the victim get to hospital, they feared coming under pressure to stump up fees for medical treatment. In May last year, India's Supreme Court ruled that "good Samaritans" would be protected from harassment. Karnataka has also passed a law stipulating that people helping road accident victims would not be subjected to harassment. However, correspondents say that many people are unaware of the rulings and do not trust police to follow them. #Trump quickly condemns #Louvres attack, still quiet on #QuebecCityMosqueShooting @CNNPolitics. #Islamophobia http://www.cnn.com/2017/02/03/politics/trump-tweet-quebec-louvre/ Last Sunday night, a French-Canadian man allegedly killed six people and injured five others during a shooting at a mosque in Quebec City. President Donald Trump has not tweeted about or publicly mentioned that incident. Early Friday morning, a man at the Louvre museum in Paris yelled "Allahu Akbar" -- in Arabic, "God is greatest" -- and attacked a group of soldiers, police said. One soldier was slightly injured. Within hours, Trump tweeted about the incident, calling the suspect a "radical Islamic terrorist" and imploring the US to "GET SMART." Trumps contrasting reactions to the two attacks have raised questions about how the identities of the suspects and victims informs the President's response. Daniel Dale, the Washington correspondent for The Toronto Star, was one of several reporters to compare the President's rapid response to the Louvre attack with his silence on Quebec. At the Louvre, the suspected attacker rushed toward a group of soldiers and guards while wielding a machete, Paris police said. He was shot by a soldier and apprehended. He had no identity documents on him, police said. By any measure, the shooting at the Quebec Islamic Cultural Center was more destructive and random. Witnesses said the alleged gunman fired indiscriminately into a crowd of worshipers at the mosque, which included men, women and children. The suspect in the Quebec attack, Alexandre Bissonnette, is a 27-year-old French-Canadian who had been known for far-right views he posted online. "I wrote him off as a xenophobe," Vincent Boissoneault, a classmate, told The Globe and Mail. "I didn't even think of him as totally racist, but he was enthralled by a borderline racist nationalist movement." your article and the 10 comments all written by you- make for a blog which is one directional. All your blogs seem to say - Hindus bad. White Americans- bad, Muslims - good. Pakistani Americans - Very good. You need to understand, the problem with USA is not Islamophobia. Its Islamonausea. Too long Islamists had a field day doing what they feel was right. Nobody had the guts to put them in Place. Trump is the first leader from west. I am sure more leaders will emerge from Europe also. Muslims seem to be unable to integrate well with the west. They in turn create problems for Hindus too. Because ordinary American cannot differentiate between them. You show a lot of glee that Hindus will also be hit with the Trump ban. But take my word. We never make an issue of it. We bare not radical. In a filing to a federal appeals court dated Sunday, nearly 100 technology companies argued that Mr. Trump’s temporary ban on all visitors from seven predominantly Muslim countries would hurt their businesses and violate both immigration law and the United States Constitution. A lower court on Friday temporarily halted crucial parts of the ban, but the Trump administration said it would fight to have them reinstated. Trump administration officials were not immediately available to comment late Sunday. The issue is set to be considered this week by the United States Court of Appeals for the Ninth Circuit, based in San Francisco. In addition to Apple, Facebook and Google, major technology names that signed the brief included Microsoft, Uber, Twitter, Airbnb, Intel and Snap, the parent of Snapchat. A few names from outside the technology field, like Levi Strauss, the jeans maker, and Chobani, a yogurt company, also signed the brief. Separately, a group of prominent Democrats also protested the ban in a court filing. The filing is likely to fray already tense relations between Mr. Trump and the technology industry. Its most prominent figures largely backed Mr. Trump’s rival, Hillary Clinton, in last year’s election campaign. He is the most successful and influential investor you have probably never heard of. His writings are so coveted and followed by Wall Street that a used copy of a book he wrote several decades ago about investing starts at $795 on Amazon, and a new copy sells for as much as $3,500. Perhaps that’s why a private letter he wrote to his investors a little over two weeks ago about investing during the age of President Trump — and offering his thoughts on the current state of the hedge fund industry — has quietly become the most sought-after reading material on Wall Street. He is Seth A. Klarman, the 59-year-old value investor who runs Baupost Group, which manages some $30 billion. While Mr. Klarman has long kept a low public profile, he is considered a giant within investment circles. He is often compared to Warren Buffett, and The Economist magazine once described him as “The Oracle of Boston,” where Baupost is based. For good measure, he is one of the very few hedge managers Mr. Buffett has publicly praised. Mr. Klarman is a registered independent and has given money to politicians from both parties. He has donated to Jeb Bush, Chris Christie, Marco Rubio, John McCain and Rudolph W. Giuliani as well as Hillary Clinton, Cory Booker and Mark Warner. Thind, who immigrated to the United States in 1913 and even trained at Camp Lewis in Washington to fight with the U.S. Army in World War I, had begun his personal struggle for citizenship five years earlier, in 1918. Through its decision, the Supreme Court quashed the hopes of Thind and fellow South Asians in the United States to gain full recognition as American citizens. It was not until 1946, more than two decades later, that South Asians were again allowed the right of citizenship. Thind, however, continued to live in the U.S., receiving a Ph.D. at Berkeley, and eventually receiving his citizenship in 1936 after Congress had decided that veterans of World War I should be eligible for naturalization.5 In 1940, Thind eventually married his wife Vivian, who herself became an active member in the Indian-America Society, and he continued to lecture across the country on issues of non-violence, spirituality, and metaphysics; he passed away in 1967. 1. It is important to note that the term 'Hindu' in the article is meant as a racial classification, not a religious one. 2. A similar case occurred months earlier, when Takao Ozawa, developed a phenotypical argument, stating that being Japanese, his skin was just as white than the average white person. The Supreme Court ruled against him. 4. Lopez, Ian Haney. White by Law: The Legal Construction of Race. New York: NYU Press, 1997. 67. 5. Chi, Sang and Emily Moberg Robinson. Voices of the Asian American and Pacific Islander Experience. Santa Barbara: Greenwood, 2012. 339.